This article is about King Amanullah Khan. For the township in Jalalabad named after him, see Ghazi Amanullah Town. For other uses, see Amanullah Khan (disambiguation). Amānullāh Khān (Pashto: امان الله خان‎) was the sovereign of the Kingdom of Afghanistan from 1919 to 1929, first as Emir and after 1926 as Malik (King). After the third Anglo-Afghan War, Afghanistan was able to pursue an independent foreign policy free from the influence of the United Kingdom, and his rule was marked by dramatic political and social change, attempting to modernize Afghanistan on Western designs. However, he did not fully succeed in this because of a popular uprising by Habibullah Kalakani and his followers. On 14 January 1929, Amanullah abdicated and fled to neighbouring British India whilst the country went into a civil war. From British India he went to Europe where after 30 years in exile died in Zürich, Switzerland, in 1960. Amanullah Khan was born on 1 June 1892, in Paghman near Kabul, Afghanistan. He was the third son of the Emir Habibullah Khan. 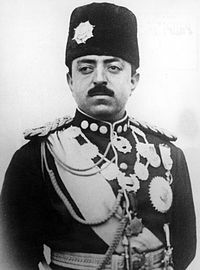 Amanullah was installed as the governor of Kabul and was in control of the army and the treasury, and gained the allegiance of most of the tribal leaders. Russia had recently undergone its Communist revolution, leading to strained relations between the country and the United Kingdom. Amanullah Khan recognized the opportunity to use the situation to gain Afghanistan's independence over its foreign affairs. He led a surprise attack against the British in India on 3 May 1919, beginning the third Anglo-Afghan war. After initial successes, the war quickly became a stalemate as the United Kingdom was still dealing with the costs of World War I. An armistice was reached towards end of 1919, and Afghanistan was completely free of British influence. Amanullah enjoyed early popularity within Afghanistan and he used his influence to modernise the country. Amanullah created new cosmopolitan schools for both boys and girls in the region and overturned centuries-old traditions such as strict dress codes for women. He increased trade with Europe and Asia. He also advanced a modernist constitution that incorporated equal rights and individual freedoms with the guidance of his father-in-law and Foreign Minister Mahmud Tarzi. His wife, Queen Soraya Tarzi played a huge role in regard to his policy towards women. This rapid modernisation created a backlash and a reactionary uprising known as the Khost rebellion which was suppressed in 1925. He also met with many Bahá'ís in India and Europe where he brought back books that are still to be found in the Kabul Library. This association later served as one of the accusations when he was overthrown. At the time, Afghanistan's foreign policy was primarily concerned with the rivalry between the Soviet Union and the United Kingdom, the so-called Great Game. Each attempted to gain the favor of Afghanistan and foil attempts by the other power to gain influence in the region. This effect was inconsistent, but generally favourable for Afghanistan; Amanullah established a limited Afghan Air Force consisting of donated Soviet planes. Amanullah travelled to Europe in late 1927. The Afghan King and Queen set out from Karachi and en route they met with King Fawad of Egypt in Cairo. 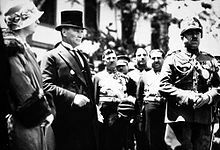 They undertook a whirlwind European visit: Italy, arrival on 8 January 1928, where they met with King Victor-Emanuel III of Italy along with his Prime Minister, Benito Mussolini and Pope Pius XI in the Vatican City; France, arrival in Nice on 22 January 1928, in Paris on 25 January, meeting with President Doumergue; Belgium, arrival on Brussels on 8 February, meeting with King Albert I and Queen Elisabeth of Belgium. The next stop was Germany. The germanophile king arrived via Germany in Berlin on 22 February to meet President Paul von Hindenburg the same day. Next he travelled to Great Britain as guests of King George V and Queen Mary. The SS steam ship Maid of Orleans arrived in Dover on 13 March. The royal couple left England on 5 April to Poland. On their way, they had a longer stopover in Berlin where the Amir underwent an emergency tonsillectomy. The royal train with the Amir back on board arrived in the Polish border town of Zbąszyń on April, 28. The next day it pulled into Warsaw to be met by Polish ministers, the speaker of the Sejm and the country's president Ignacy Mościcki. At his request Amanullah was granted a possible audience with the First Marshal of Poland Józef Piłsudski. The Afghan party departed from Warsaw travelling east across the country to the border with the Soviet Union on 2 May 1928. During Amanullah's visit to Europe, opposition to his rule increased, an uprising in Jalalabad culminated in a march to the capital, and much of the army deserted rather than resist. In early 1929, Amanullah abdicated and went into temporary exile in then British India. His brother Inayatullah Khan became the next king of Afghanistan for a few days until Habibullah Kalakani took over. However, Kalakani's nine months rule was soon replaced by Nadir Khan on 13 October 1929. Amanullah Khan attempted to return to Afghanistan, but he had little support from the people. From British India, the ex-king traveled to Europe and settled in Italy, buying a villa in Rome's Prati neighborhood. Meanwhile, Nadir Khan made sure his return to Afghanistan was impossible by engaging in propaganda. Most of his reforms had been reversed, but the later King, Mohammad Zahir Shah, made a more gradual program of reform. In 1941, some press in the west reported that Amanullah was now working as an agent for Nazi Germany in Berlin. It is believed he was involved in plans to regain his throne with Axis help, despite Afghanistan's neutrality. However following the Axis loss in Stalingrad in 1943, the plans cooled off and were never executed. Amanullah Khan died in Zürich, Switzerland, in 1960. His body was brought to Afghanistan and buried in the eastern city of Jalalabad. ^ Poullada, L. B. "AMĀNALLĀH". Encyclopædia Iranica (Online ed.). United States: Columbia University. ^ AAS 20 (1928), n. 3, p. 93. This page is based on the Wikipedia article Amanullah Khan; it is used under the Creative Commons Attribution-ShareAlike 3.0 Unported License (CC-BY-SA). You may redistribute it, verbatim or modified, providing that you comply with the terms of the CC-BY-SA.